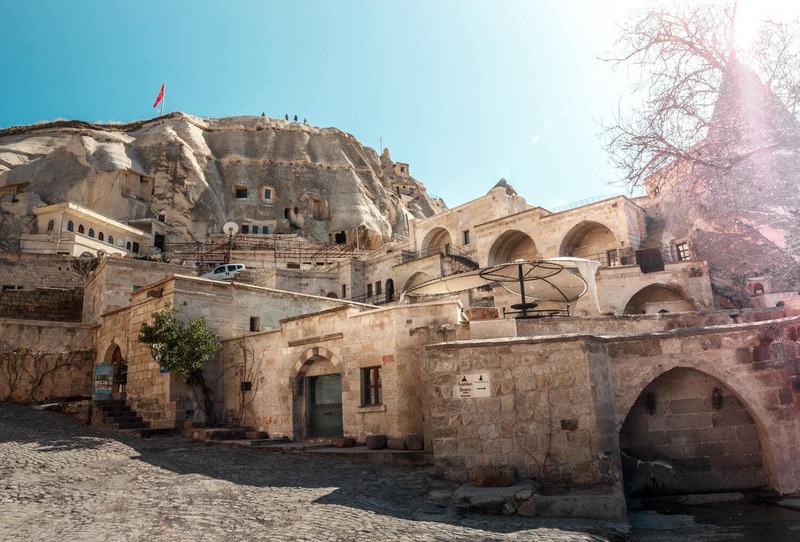 [vc_row][vc_column][vc_column_text]Millions of years ago volcanic eruptions covered the entire region of Cappadocia with thick ash. The ash solidified into soft rock, and natural erosion over the years has created the unique geological formations the region is known for. 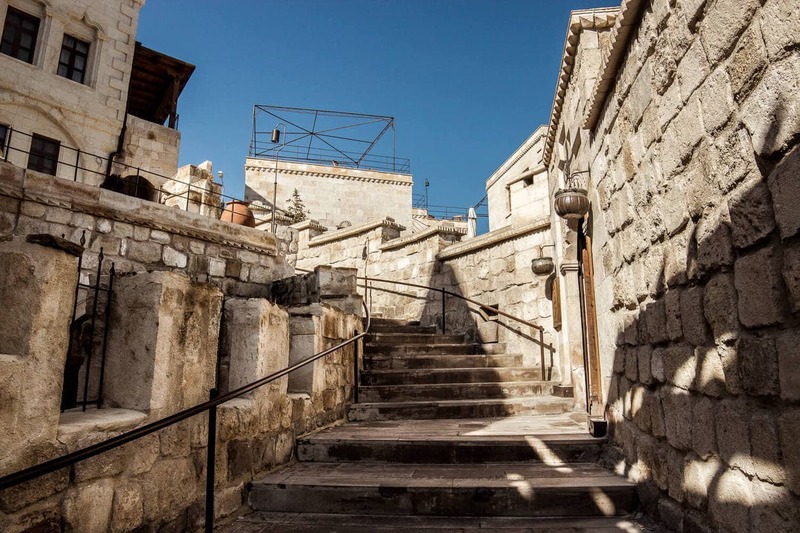 In as early as 1800-1200 B.C, people began tunneling into the soft rock creating churches, houses and hiding places. 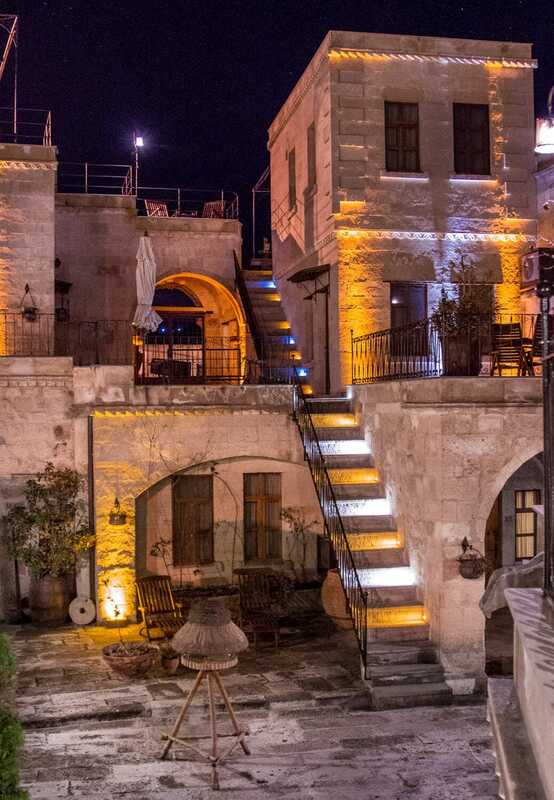 Today, hotels, restaurants and shops are still built within and around the ancient rocks. 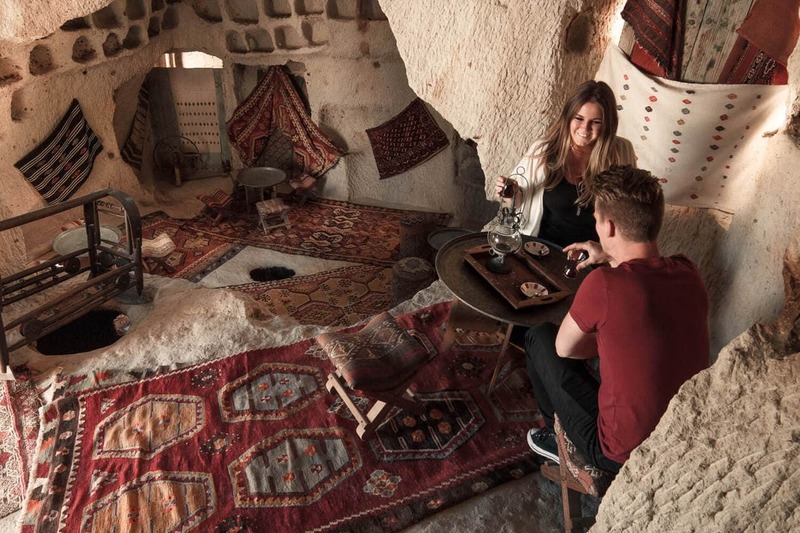 Right up there with riding in a hot air balloon, sleeping in a Cappadocia cave hotel is at the top of everyone’s list when visiting this special region. 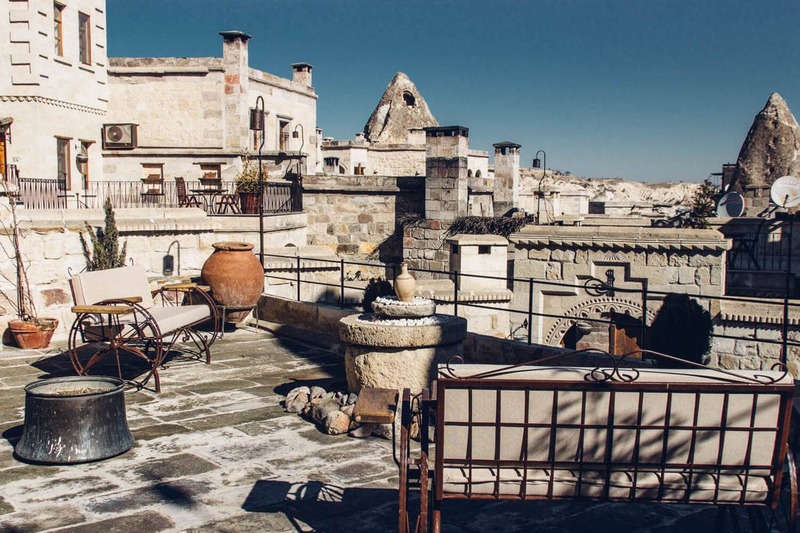 Keep reading for our review of Mithra Cave Hotel plus scroll all the way down for a few other cave hotel recommendations (with great hot air balloon views!) to fit any budget. 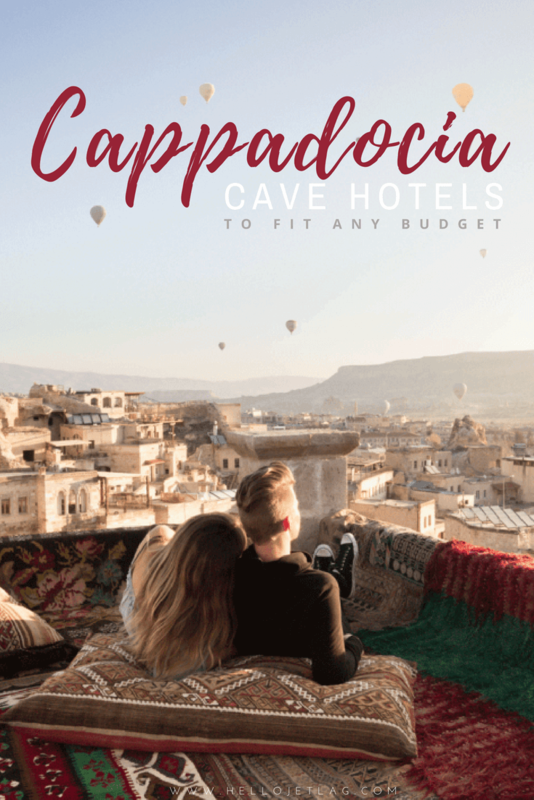 Before our trip, I researched the Cappadocia cave hotel options to death until finally picking the perfect one for our stay. My most important (and pretty much only) requirement was that I needed to have a great, unobstructed view of the morning hot air balloons. 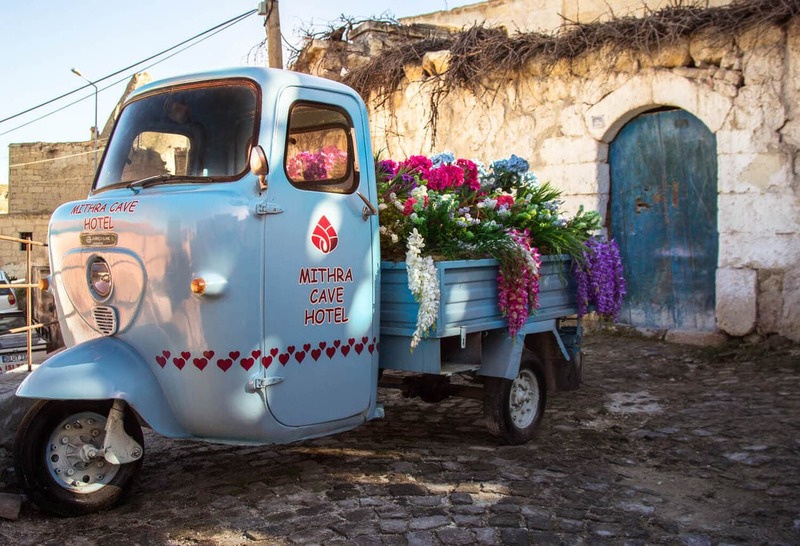 We eventually decided on Mithra Cave Hotel and could not have been happier with the decision. 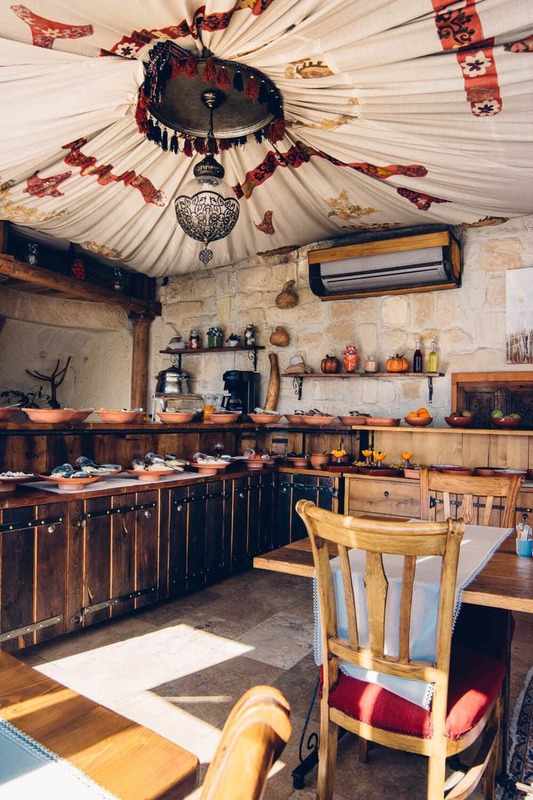 It was a romantic cave hotel on the top of Aydinli Hill with an incredible view, delicious breakfast and comfortable room. 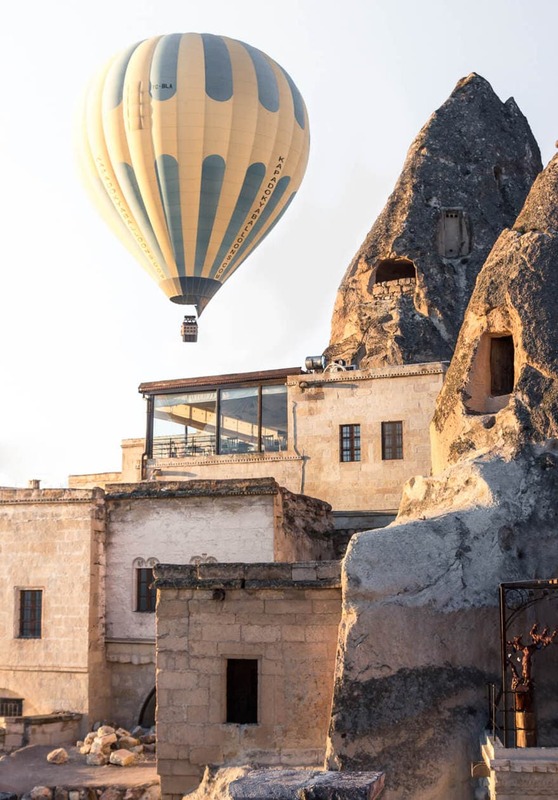 Every morning 100’s of hot air balloons rise over Goreme and it’s a spectacular sight to be able to walk right out of your room and see it. The balloons fly at sunrise which is why I wanted a hotel with a view. Driving around a 5am searching for the perfect lookout spot was not in the cards for us. Sultan Cave Suites was my first choice hotel because their viewing setup is unrivaled, but we ended up deciding on Mithra Cave Hotel because it was 1/2 the price. Fortunately, in a perfect circumstance of events, we discovered that the terrace to our room directly bordered Sultan Cave Suites’ balcony! In the morning, I stealthily hopped over the wall and got exactly what I was looking for. 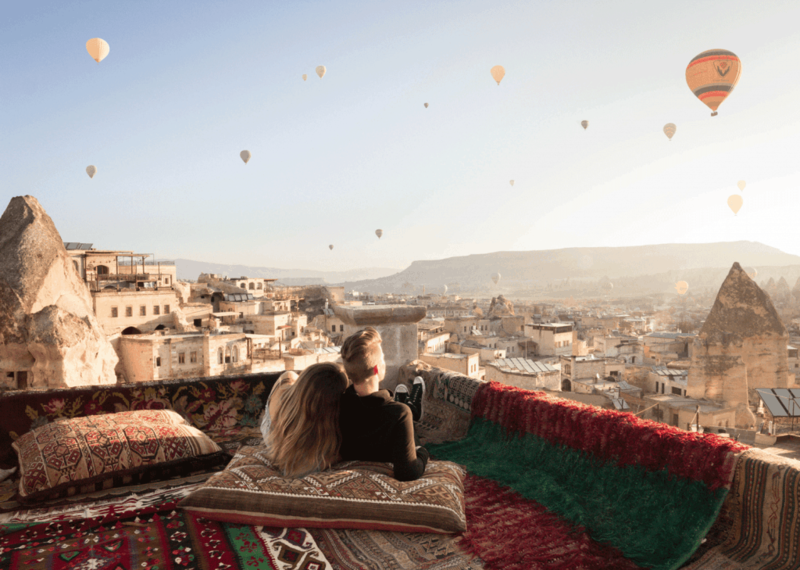 If you’re not down with trespassing, Mithra Cave Hotel does offer several seating areas to watch the hot air balloons with an [almost] equivalent view. I thought more people would be outside to see the morning spectacle, but we pretty much had the entire hotel grounds to ourselves. 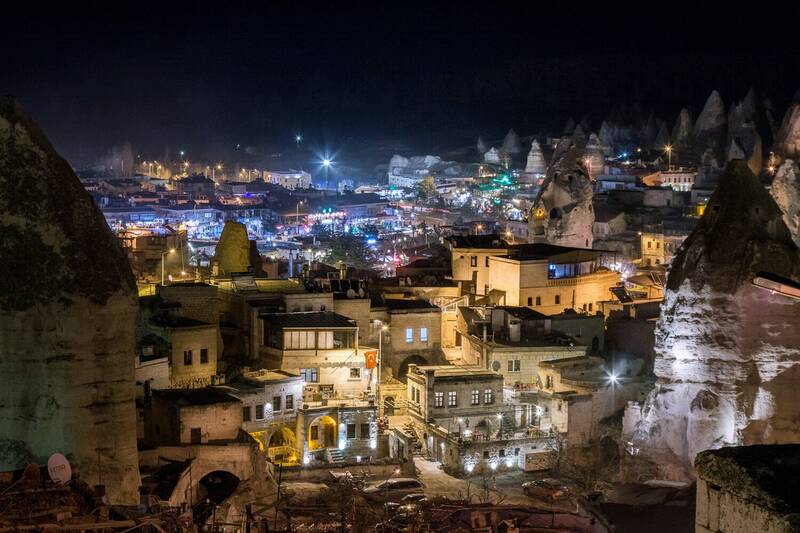 The hotel sits on a hill which gives you one of the best views in all of Goreme at any time of the day. We stayed in one of Mithra Cave Hotel’s deluxe rooms. It was decorated Ottoman style and was exactly what I was looking for. 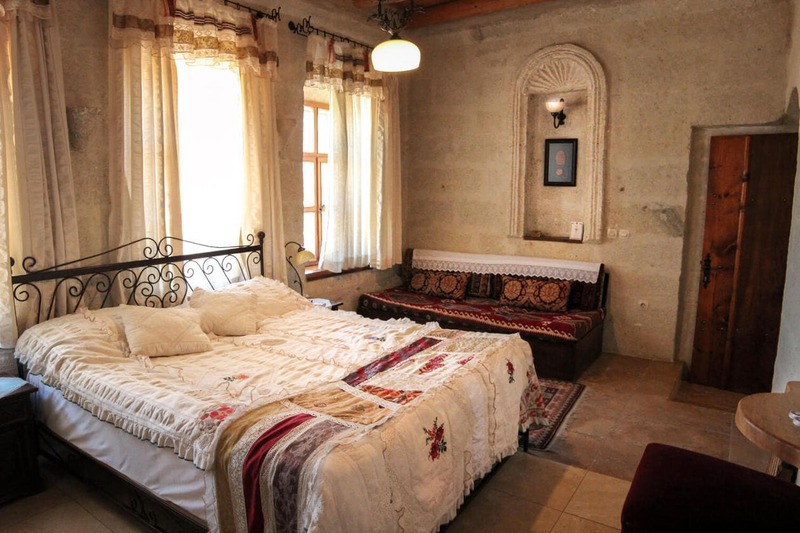 Cappadocia is so unique, it was important that our accommodations fit in with the overall ‘feel’ of the place. 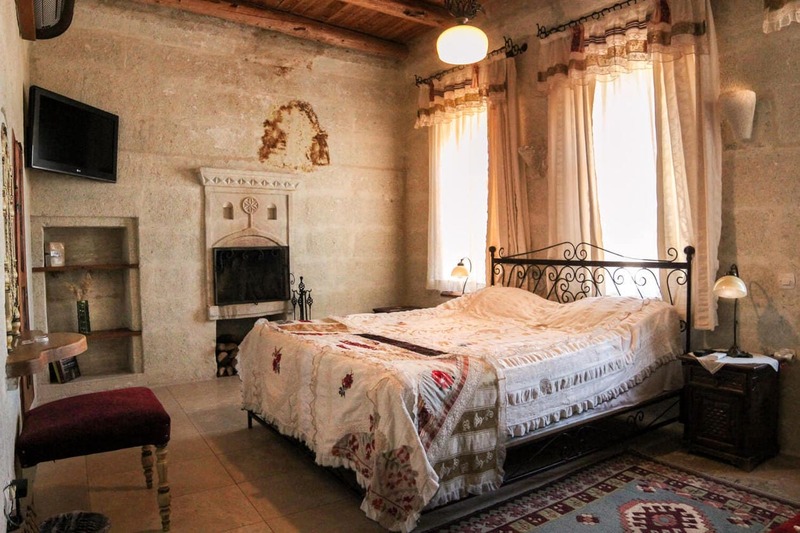 We had our own private terrace, and there was little fireplace next to the bed that would’ve been amazing if I could’ve figured out how to get it to work. The people in the room below us lit theirs every night and it heated up our floors which was really nice when the temps dropped. Overall, we didn’t spend much time in the room but the bed was comfortable, the wifi was strong and the shower was hot. 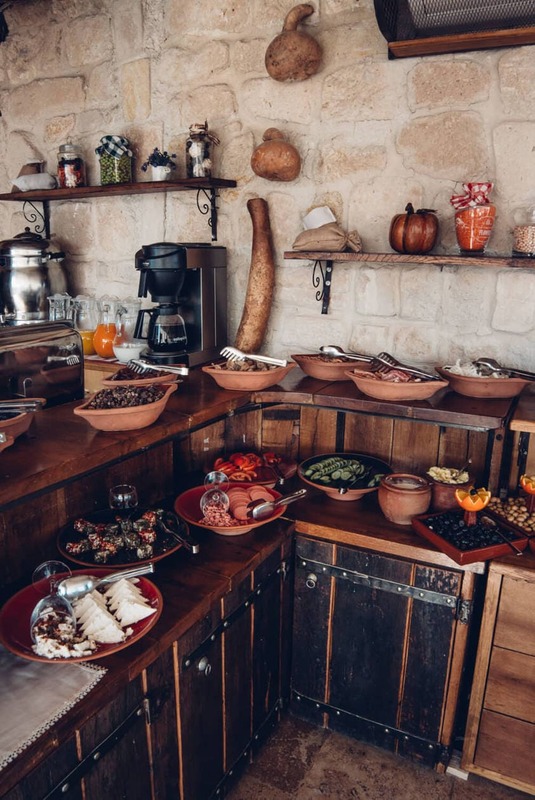 A traditional Turkish breakfast buffet is included in your stay and it was our favorite hotel breakfast while in Turkey. 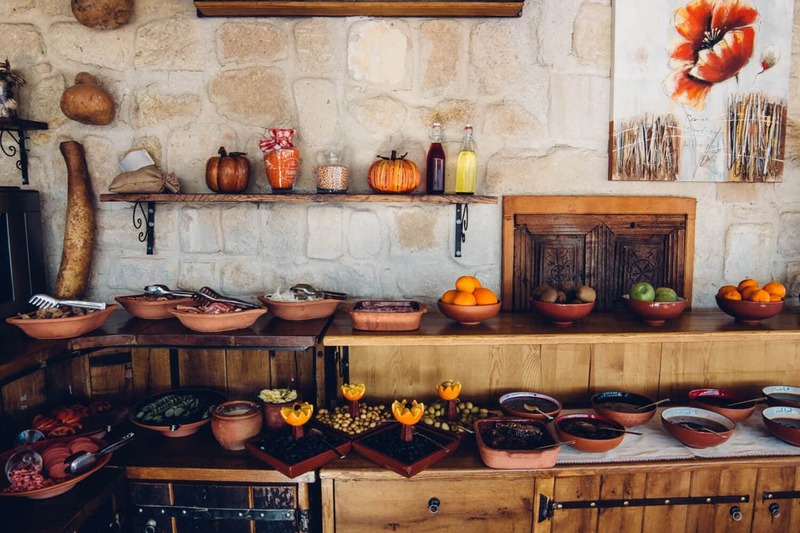 There were 8 different kinds of assorted cheese, dried fruits and nuts, olives, honeycomb, breads, borek, eggs and of course, unlimited Turkish tea. The best part of going to breakfast every morning was getting to sit in front of this view. 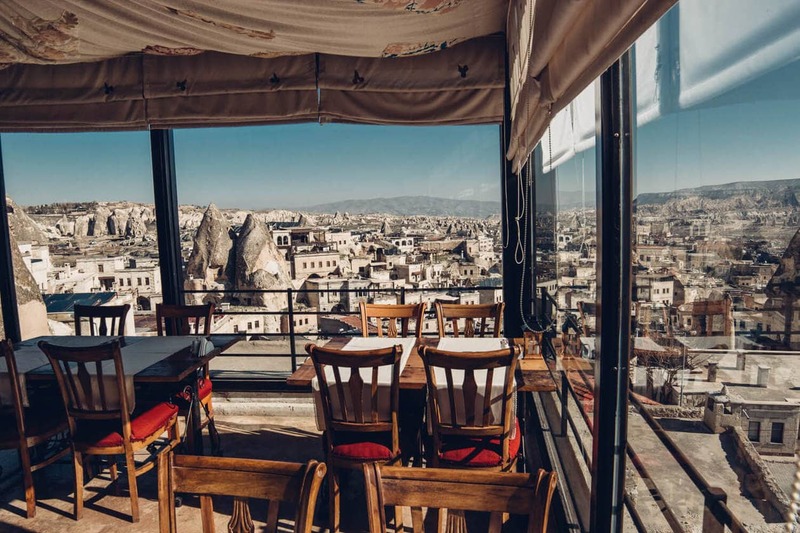 Mithra’s restaurant sits at the highest point in the hotel, and large windows from every angle give you an incredible panoramic view to enjoy while you eat. LOCATION: The hotel located on a hill, and while this gives you an incredible vantage point, but it’s a little further than some of the other hotels closer to the town center. 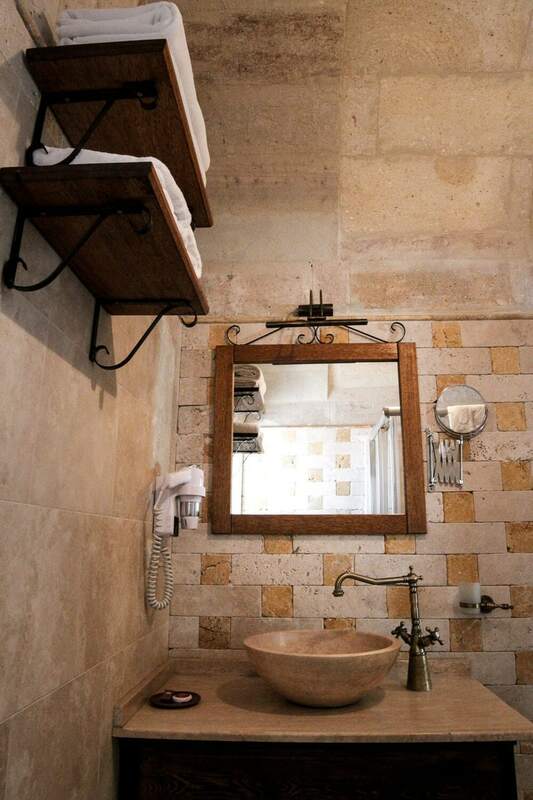 From Mithra Cave Hotel, it’s a 5 min walk downhill and a 10-15 minute walk uphill. PARKING: There is free parking on the street outside the hotel. We had a rental car and it was never an issue, even coming back late at night. 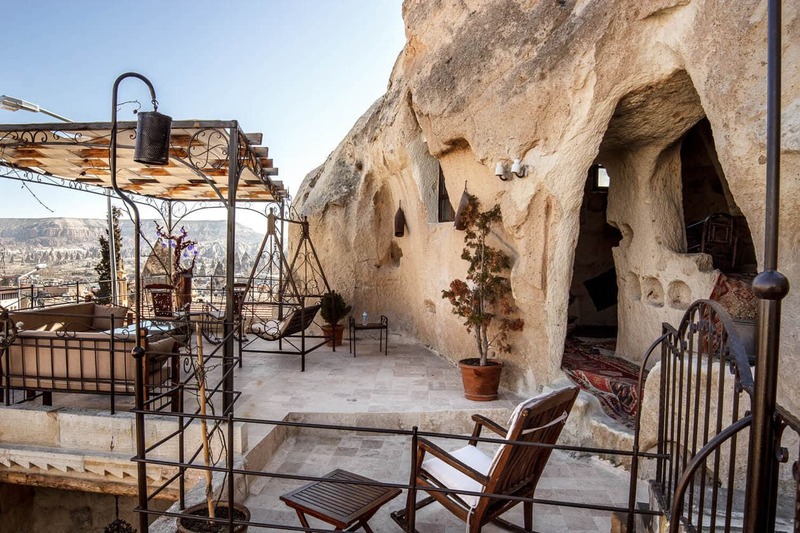 YASIN’S PLACE CAVE HOTEL While there are a few hostels in Goreme that offer cheaper accommodations than Yasin’s Place, this backpacker’s hotel is one of the only one’s I could find that offer cave rooms. 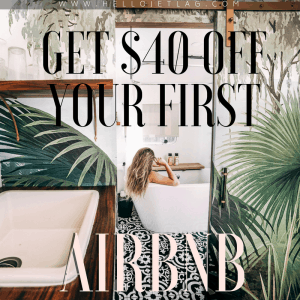 For around $15-20 you can get a private room with a shared bathroom, and it includes breakfast. 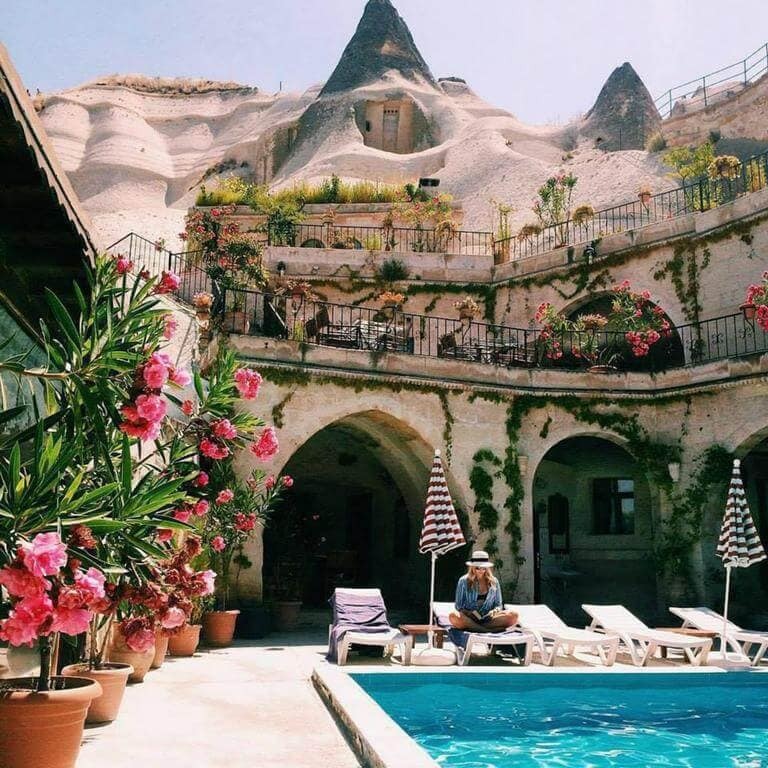 LOCAL CAVE HOUSE HOTEL This Cappadocia cave hotel is surrounded by fairy chimneys and it has a pool right in the middle which lends itself for great photos. It’s also a super quick walk to the center of town. 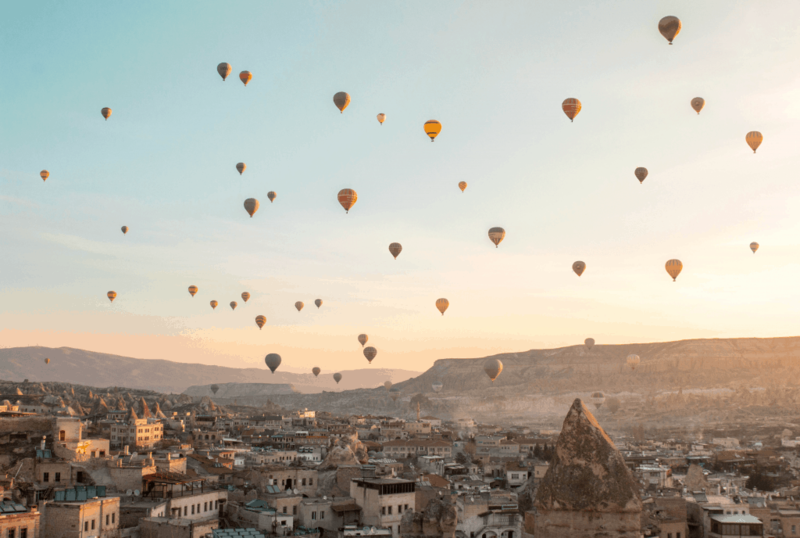 It doesn’t have the best view of the hot air balloons which is why I decided against it, but it has great reviews and is extremely affordable. SULTAN CAVE SUITES The owner of Sultan Cave Suites is a genius. 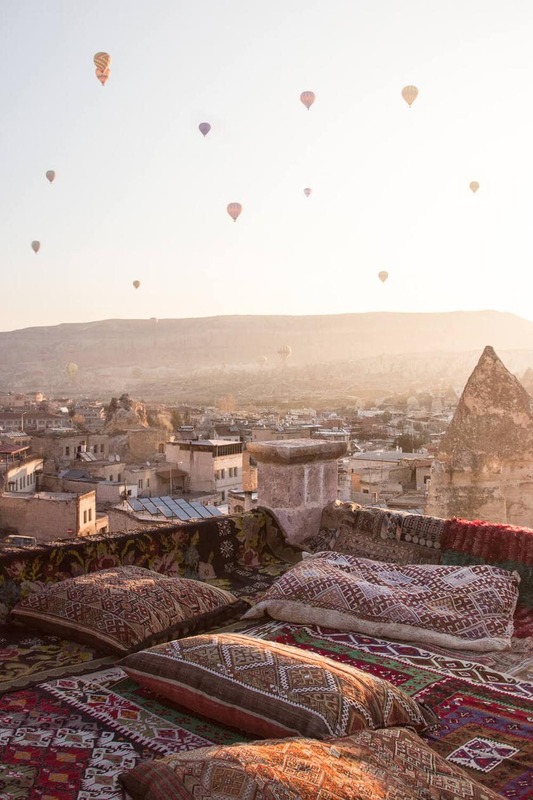 Every morning he transforms his roof into a perfect photo op, laying down Turkish rugs, oversized pillows and sometimes even a full breakfast spread. He was kind enough to let us take pictures on his room even though we weren’t staying there. 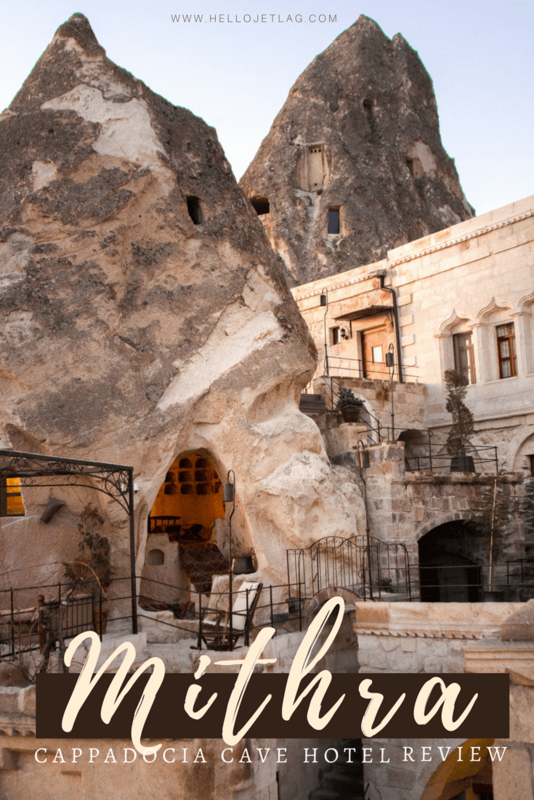 His hotel is one of the top rated in Goreme. 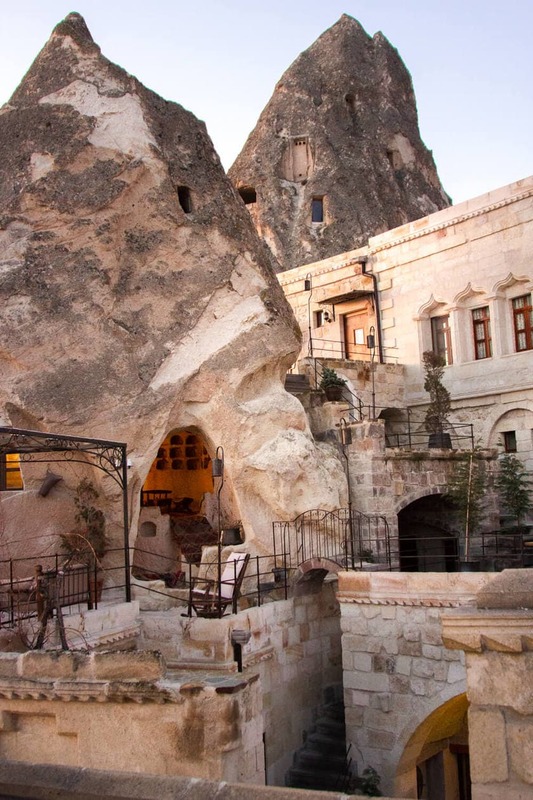 MUSEUM HOTEL Museum Hotel is about a mile and a half from the center of Goreme, in Uchisar. 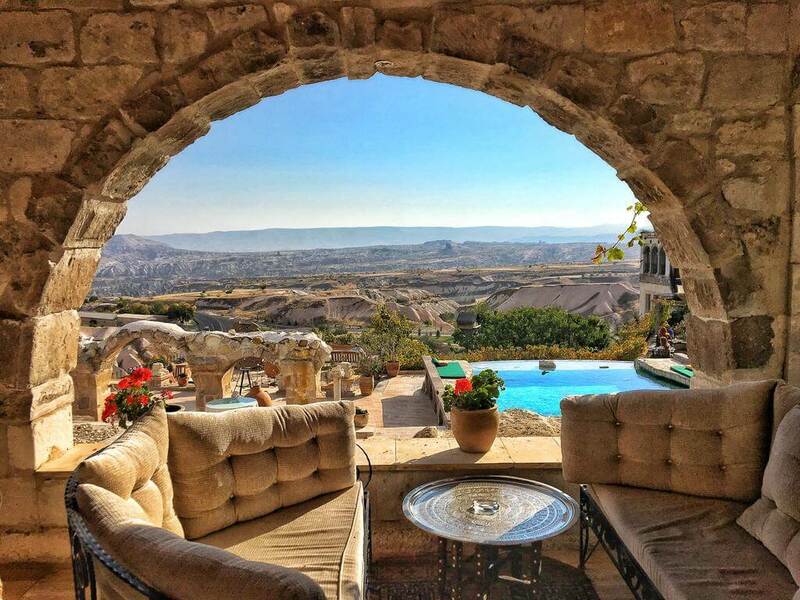 The property is beautiful and they have a fantastic view of all Goreme. 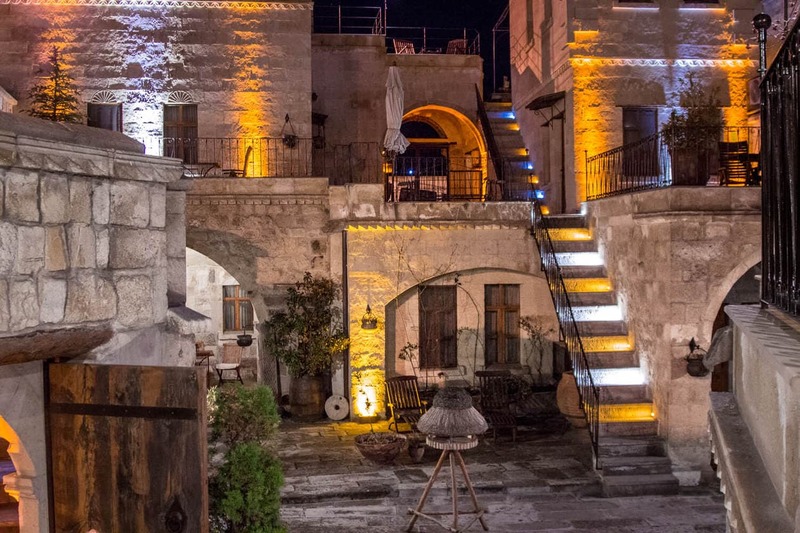 Museum Hotel has won prestigious awards such as Best Luxury Boutique Hotel in Europe, Best Hotel Architecture in Europe and Best Hotel in Cappadocia. 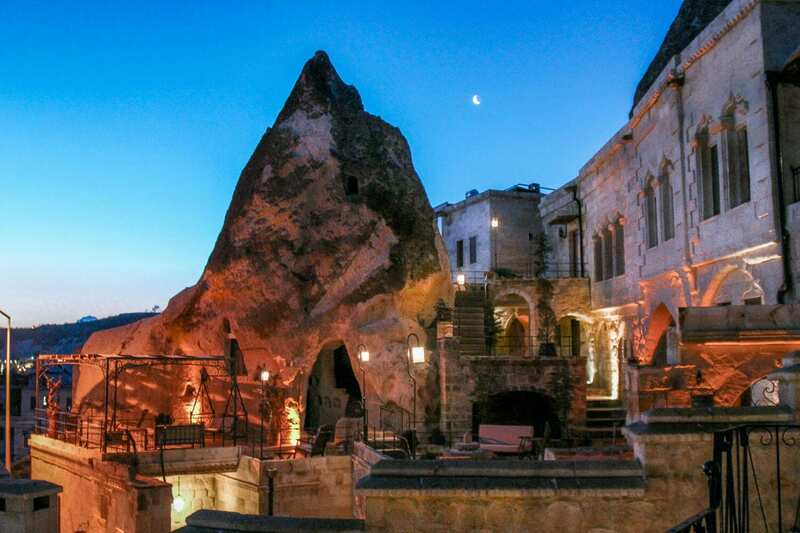 Have you stayed in a Cappadocia Cave Hotel? Which One?